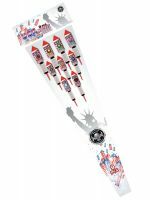 USA Rockets includes 9 artillery-style breaks with assorted colors and effects. 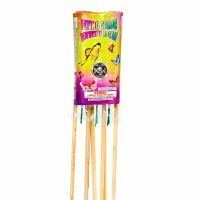 Contrary to the name of these rockets, Jet Screamer rockets do not actually have any whistle. They are however, some of our best rockets. Jet Screamers fly high and break hard into artillery-style bursts of red wave, gold willow, and brocade effects. This rocket shoots into the air before bursting into a parachute with a green flare. 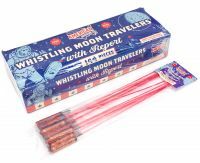 Glitterous Lights rockets fly into the air with a fiery tail and produce a white glittering effect in the sky. 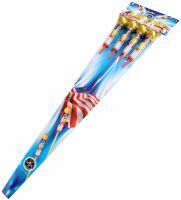 This rocket fires into the air and displays multi-color stars. This rocket goes up and showers dancing gold bees. 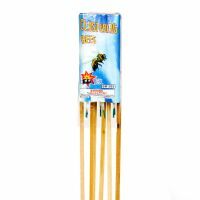 Light 'em Up is a 4-pack of artillery rockets. 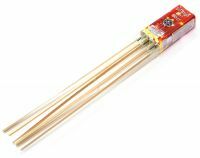 Each rocket features a hard break, and outstanding effects including: gold willows, gold chrysanthemums, silver chrysanthemums, and gold brocades! Double Ring rockets streak into the air, and burst into two, different color rings! 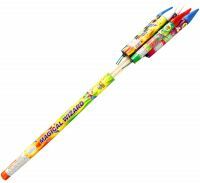 Magical Wizard rockets streak into the sky with a fiery tail and burst into color with a loud break! 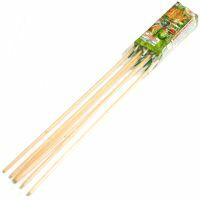 Each pack has 6 rockets. 1.5" artillery rockets that burst into "smiley faces."